The Mars Desert Research Station greenhouse was destroyed by a fire. Fire damage to the Mars Desert Research Station greenhouse. 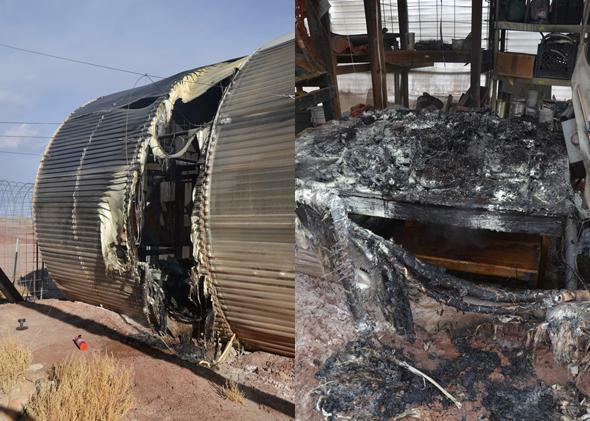 At a simulated Mars research station in the Utah desert, a recent fire caused extensive damage to a central greenhouse. No one in the four-member crew was injured, but the incident is a sobering reminder of what could go wrong during a mission to Mars. The idea of a manned mission to Mars is moving closer to feasability, but there are a lot of details to work out first. What are the ethical implications of such a mission? Should a Mars crew be all female? What’s the best way to set up a station on Mars that can support human life? To answer these questions and many more, groups like the Mars Desert Research Station (MDRS), which is owned and operated by the Mars Society, explore the logistics of creating a safe and self-sustaining environment for humans on both a spacecraft and Mars itself. On Dec. 29, the first day of a new mission, the MDRS crew members noticed an unusual power surge and then saw smoke coming from the greenhouse, nicknamed the GreenHab. An electrical heater placed too close to some wooden shelves had started a fire, which in turn was causing the power surge as it compromised outlets in the greenhouse. As Space.com reports, the crew attempted to extinguish the fire while it was still relatively small, but it grew, with flames reaching about 10 feet into the air. After about a half-hour, the crew was able to contain the situation by cutting power to the GreenHab, and using fire extinguishers and water to control the flames. MDRS is 20 to 30 minutes away from the nearest town—Hanksville, Utah—so emergency response vehicles couldn’t reach the site immediately. The Wayne County sheriff did respond later that day, though, and a few days after a fire marshal ruled the incident an accident.